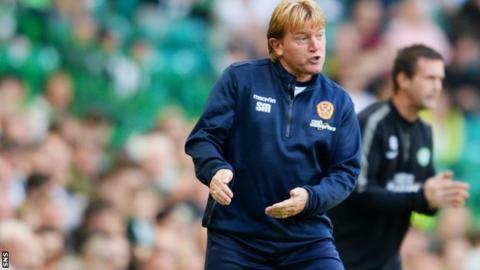 Motherwell manager Stuart McCall reckons his side were denied a penalty in their 1-1 draw with Celtic. John Sutton gave 'Well the lead at Celtic Park but Kris Commons levelled from the spot after the break. McCall, however, says his side should have had a penalty when Iain Vigurs' first-half effort hit Jason Denayer. "The ref says he thought the shot was too near the boy but he's four yards away when Vigurs hits it and it's a clear save - a great save," he said. The visitors played well in the first half and should have scored a second soon after their opener, but Sutton spurned the chance. But McCall was delighted to come away with a point after seeing his outfit net for the first time at Celtic Park since he took over almost four years ago. "We could have done [got three points] but we're delighted to get a goal, first and foremost, because we've not got a goal since I've been coming here," the Motherwell manager told BBC Scotland. "It was a great goal and Sutty could have had another straight after it. And but for a great save by Denayer in the box we could have had a penalty, I don't think there's any doubt about that. "Today it was one penalty that should have been given and one that was given, but I don't want to whinge about it. "Second half we were camped in but first half we were excellent and I'm delighted with them. "Dundee United, what a good side they can be, and they came here and lost six, and I saw Aberdeen here who, as well as they played in patches, could've lost more than two. "So you've got to be careful you're not just open. We played with a sitting midfielder and we had to do that."